Super Simple No-Knead Bread using just 4 basic ingredients and some time which makes a super chewy crust with a soft and fluffy middle. 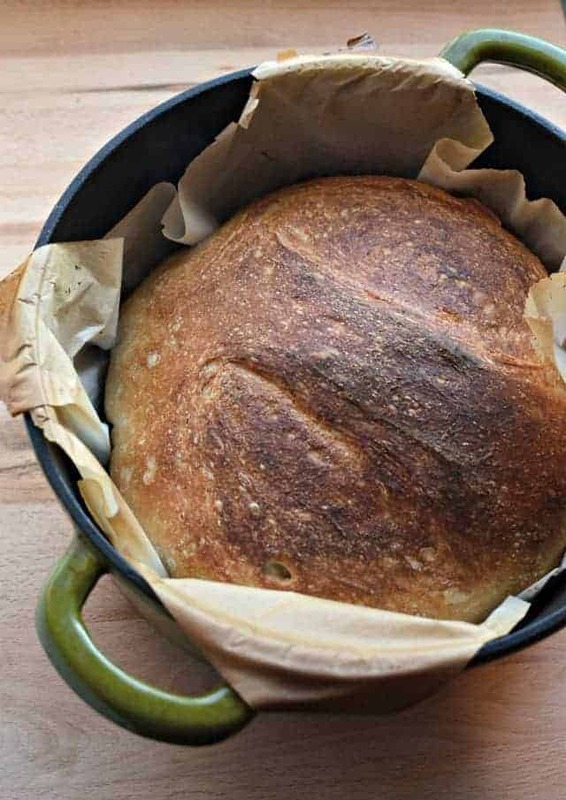 Even if you think you fall in the “can’t make bread” category, you have to give this super simple no-knead bread recipe a shot. I discovered this no-knead bread maybe 3 years ago and have been making it since with great success. I dare say this is a never-fail bread recipe even you non-bakers out there can make. The secret is in the resting period. You mix 4 simple ingredients together and let them sit for anywhere from 8 to 24 hours. The gluten develops while the dough rests which means you don’t have to do any kneading. The bread is extra wet, which means it gets nice and chewy in the middle. You cook it covered for part of the time and uncovered the rest, which results in an extra crusty crust. Chewy middle and extra crusty outside… pass the butter, I’m sold! Here’s what the bread looks like after its resting period. It will swell but still be bubbly looking and flat on the top. This recipe is so easy, and you have fresh bread ready for dinner. Who doesn’t love that delicious smell and simple goodness? Trust me on this, homemade bread equals love. I’ve had great success with using half whole wheat and half all-purpose flour as well as using 100% whole wheat flour for this recipe. You don’t have to use cast iron or enamel coated cast iron, though I highly recommend it. I love mine and use it all of the time. Anything that is oven safe with a lid will work. You can let this dough rest for anywhere from 8 to 24 hours which means you have a lot of flexibility when you cook it. 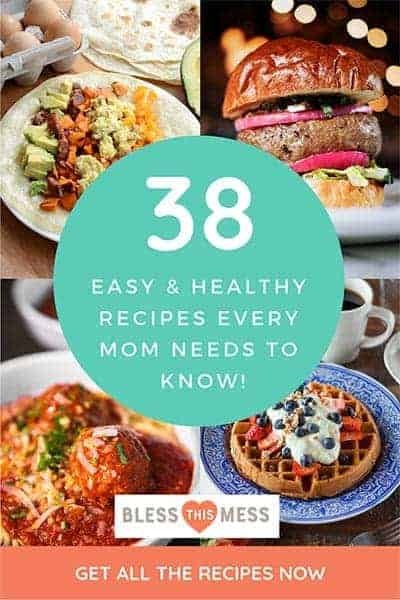 Mix it up in the morning for dinner or make it at night when you get home to cook the next night. You’ll love how versatile the resting time is. Is instant yeast the same as rapid rise yeast? Yes, they are the same. Using instant yeast shortens the rising time by as much as 50%. In a large bowl add the flour, salt, and yeast. Mix to combine. Add the water and mix until it all comes together. The dough will be soft and “shaggy”. Cover the bowl tightly with plastic wrap or a lid and let it rest at room-temperature for 8 to 24 hours. When you are ready to bake your dough turn it out onto a well floured surface and shape it into a ball. Set the ball on a large piece of parchment paper. Place the parchment paper and dough in a large cast iron skillet with a lid (6 to 9 quart cast iron dutch oven work best). Let it rest for 20 minutes. Preheat the oven to 450 degrees. Place the pot, with the lid on, inside the oven and bake the bread for 30 minutes. Carefully remove the lid and back for another 20 minutes until the top is dark brown. Remove the pan from the oven and then remove the bread from the pan by holding onto the edges of the parchment paper. Let the bread cool on a wire rack for at least an hour before serving. Sometimes the simplest things taste the very best. Thanks for stopping in. You are a bright spot in my day! 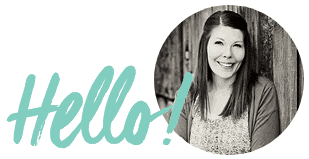 Hello Melissa. I hope you are well. This seems to be about as easy as it gets short of throwing the stuff in a bread maker and going for a walk and coming back to bread ready to go. I do have a question about breads in general. I like soft crust on breads, more like the store bought stuff, or the soft bread sticks at some of the pizza places. How do I get soft crusts rather than the crunchy crusts that I get now? I could use this recipe for buns for burgers and sliders and freeze them, couldn’t I? Generally a dough with eggs in it will be really tender, milk also makes it softer. 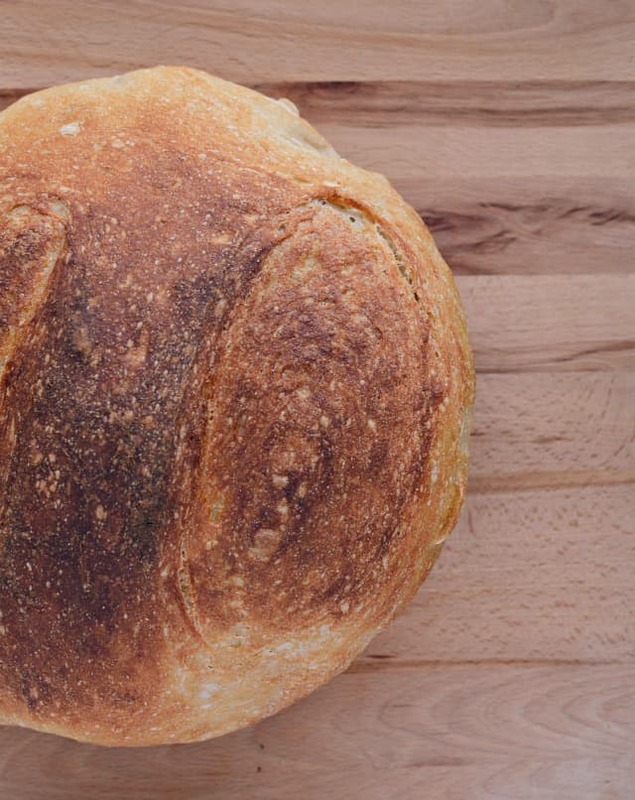 King Arthur Flour has a great white sandwich bread recipe that we love too. This recipes is definitely more of a soup bread, but you might light some of those other recipes for a really soft loaf! Just brush the crust with butter when you remove from pan, and after it cools, store in plastic versus paper for a soft crust. 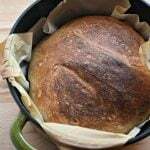 I love homemade bread- nothing is better than a warm chewy piece of bread with butter on it. 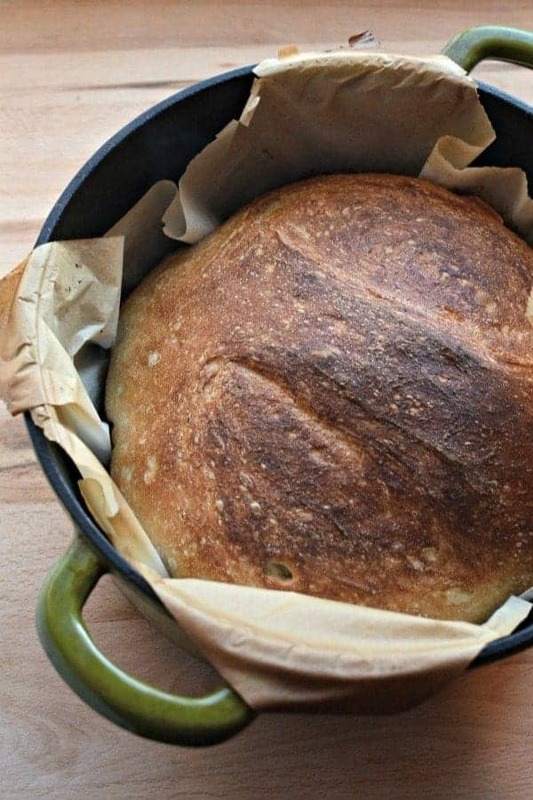 This looks super simple bread to make and I love the texture and perfectly baked bread. I am sure going to try this ! I can’t seem to get over how crunchy this crust seems!!! I really want to try this- could I cover with foil if no pan with lid? I think so if you cover it really tightly so it traps it’s own steam inside! Yes! So easy to dress up, herbs, roasted garlic, cheese, and even things like nuts, dried fruit and orange zest! This is a great one to try, you can’t go wrong! Is it too long if the fermentation lasts from 8 to 24 hours? Nope, just makes it better! The dough is very stiff. I did not get a wet dough. Is there something I missed? I’d add more water, it should be a loose and “shaggy” dough, you won’t hurt anything by adding a bit more until it loosens up a bit! 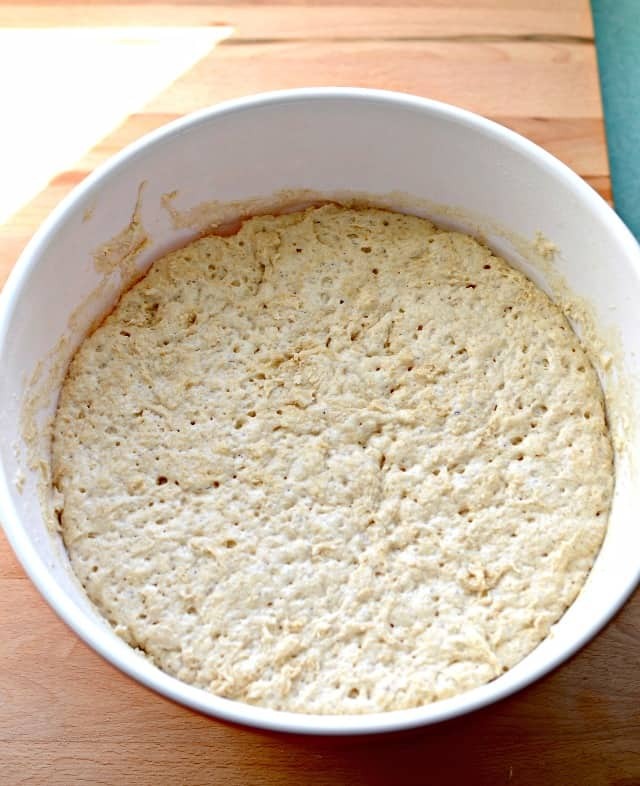 Hands down the most simple to make yeast bread. And most importantly, delicious! My family of five enjoyed it with our lasagna. Will be making this again and again. I’m so glad you like it as much as we do. SO good right?! And you can’t beat how easy! Pro tip: use the dough for pizza crust sometimes, so chewy and delicious! This is seriously THE best bread recipe and it is so easy! My family tried this for the first time a few months ago and it has become our staple homemade bread go-to! The chewy crust and soft inside is soooooo good!